LiMe is a Loadable Kernel Module (LKM) Linux memory extractor which allows for volatile memory acquisition from Linux and Linux-based devices, such as Android. This makes LiME unique as it is the first tool that allows for full memory captures on Android devices. It also minimizes its interaction between user and kernel space processes during acquisition, which allows it to produce memory captures that are more forensically sound than those of other tools designed for Linux memory acquisition. Detailed documentation on LiME’s usage and internals can be found in the “doc” directory of the project. 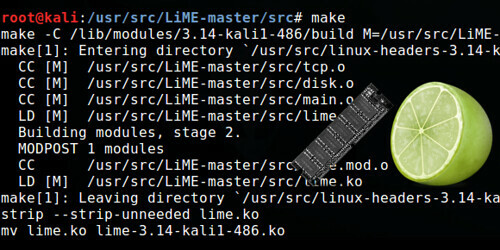 LiME utilizes the insmod command to load the module, passing required arguments for its execution. insmod ./lime.ko "path=<outfile | tcp:<port>> format=<raw|padded|lime> [dio=<0|1>]"
$ adb push lime.ko /sdcard/lime.ko $ adb forward tcp:4444 tcp:4444 $ adb shell $ su # insmod /sdcard/lime.ko "path=tcp:4444 format=lime"
# insmod /sdcard/lime.ko "path=tcp:4444 format=lime"
# insmod /sdcard/lime.ko "path=/sdcard/ram.lime format=lime"